President Vladimir Putin on Wednesday accepted the resignation of Igor Ivanov as secretary of Russia's Security Council, a council official told The Associated Press. Ivanov, 61, a former foreign minister, was reported to have submitted his resignation in early July. A presidential decree accepting his letter of resignation was to be issued by the Kremlin later Wednesday, the official said. He has expressed frustration about his diminished political influence, Russian newspapers have reported. Under his predecessors, the Security Council, which advises the president, wielded considerable clout. But in recent years its influence has declined. Ivanov, who had served as foreign minister since 1998, was appointed to the Security Council post in 2004 to replace Sergei Ivanov, now a first deputy prime minister seen as a leading candidate to succeed Putin next year. Putin also once held the post. Alexander Golts, security writer for the online Ezhenedelny Zhurnal, said Igor Ivanov's resignation may indicate the start of further shuffling of posts to be carried out by Putin as Russia approaches parliamentary elections in December and presidential elections in March. At the same time, Golts said, "the most sensible explanation" for Ivanov's stepping down is that "someone has his eye on his position." Golts said Ivanov had limited influence as Security Council chief compared with his predecessor, Sergei Ivanov, who is close to Putin. 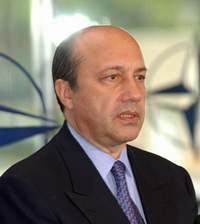 Ivan Rybkin, who headed the council from 1996 to 1998, said last week on Ekho Moskvy radio that the council's influence much depended on the secretary.